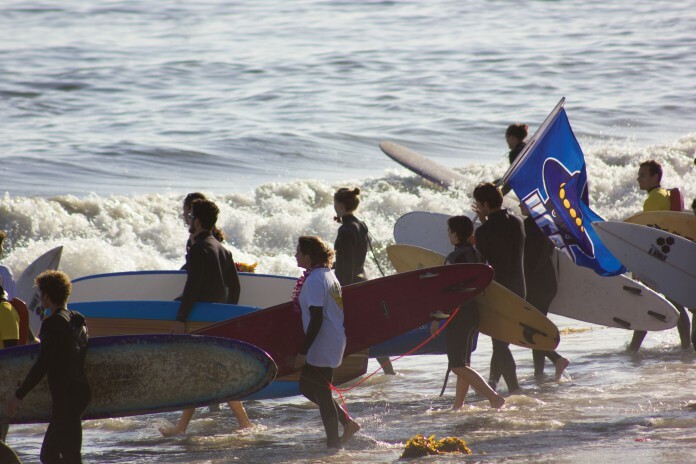 Students, Isla Vista residents, and other local supporters gathered by the hundreds at the beach bordering the University of California, Santa Barbara on Wednesday, May 27 for the second annual Memorial Paddle Out to honor the victims of the tragedy in IV on May 23 of last year. Surfers began paddling their boards from the shore east of Manzanita Village at about 6 PM that evening, led by members of the UCSB Surf Team, who hosted the event. Lifeguards paddled out on surf-rescue boards to assist if needed. New arrivals continued to paddle out, and pedestrians lined the beach for as long as half an hour after the initial wave of paddlers left the shore. According to surf team member and third-year English major Madeline Lockhart, the structure of the paddle-out largely resembled traditional memorial paddle-outs that have long been part of surf culture. Once the paddlers reached a certain point on the water they arranged themselves into a large circle, with members of the team leading the ceremony from the center. Five members spoke about the sacred space for healing provided by the ocean, as well as the importance of remembrance. After each of the six victims’ names were announced, a member tossed a flower lei onto the water in his or her honor. To conclude the ceremony, participants paddled toward the circle’s center with exuberant cheers and splashes that resounded on the shore. Lockhart values the ceremony because, unlike other memorials, she said, the paddle-out is not accessible to the camera crews that often flock to report on events related to last year’s shooting. When UCSB approached the team about holding the paddle-out as part of the university’s scheduled memorial events, the team had already been planning to commission the event once more, according to surf team captain and fourth-year environmental studies major Mikey Pawell. He feels that the paddle-out offers a unique emotional outlet for UCSB students and others with ties to IV. Paddlers and observers alike carried flowers, some tucked behind ears or into wetsuits. Representatives from the Associated Students Commission on Student Well-Being also passed out royal blue bracelets to attendees as memorial tokens. “We wanted something for all students to have and to be able to wear and be seen by other students, to really feel truly woven together and connected,” said Ashley Rahbarpour, a second-year biopsychology major and COSWB outreach coordinator. The woven design of the bracelets is meant to reflect a “Woven Together” theme the organization has been promoting in remembrance of the tragedy. Their royal blue color was inspired by the Blunite IV memorial campaign to illuminate Isla Vista with blue LED lights throughout the month of May. Fourth-year English and psychology double major Andrea Vallone said she values the paddle-out as a means of healing unique to the IV community. Lockhart said she and other team members have already discussed holding the paddle-out again next year.